Rush Remix Their Polarizing Album Vapor Trails – Premiere | Music News | Rolling Stone. Watch the webcast replay above ! As well as announcing the winners of the Award and Competition, I’m excited to announce that for the first time I did a public demonstration of the new plugin I’ve been developing, which is highly relevant to DRD and the Loudness Wars. Afterwards there is a 40-minute Q&A on DRD, the loudness wars and mastering in general. DRD Thing the Eleventh – Watch the Webcast – NOW ! The Dynamic Range Day Webcast is online, now – share this link with your friends ! DRD Thing the Tenth – How Loud Should You Bieber ? Post this image everywhere – it’s the truth ! The Dynamic Range Day Webcast is at 10pm GMT tonight. And if you’re on G+, invite everyone in your circles ! Spread this image far and wide ! Find more Things You Can Do to promote Dynamic Range Day here ! The loudness war is actually a huge opportunity for people who want their music to stand out ! – and feel free to try a few of our other 11 Things To Do On Dynamic Range Day ! 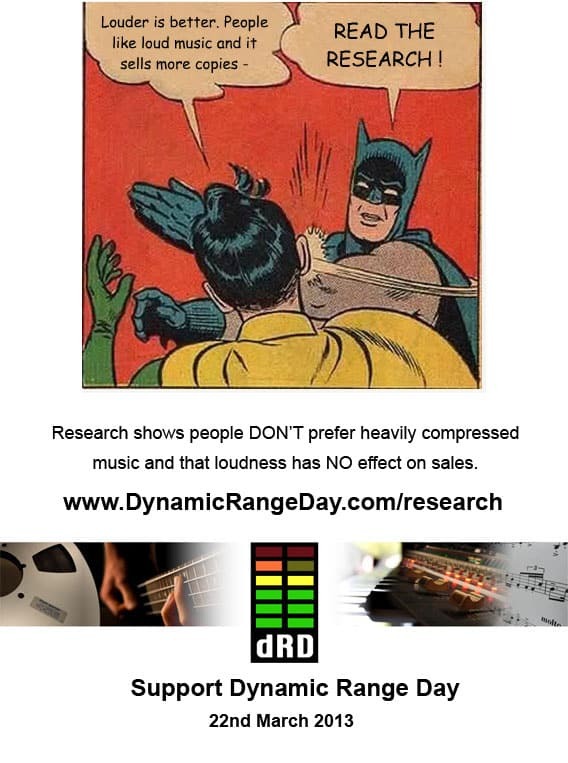 If you’ve been doing all the Things we suggest to help promote Dynamic Range Day today, then the chances are your friends and followers are starting to say “DRD ? WTF ?” – or, words to that effect ! 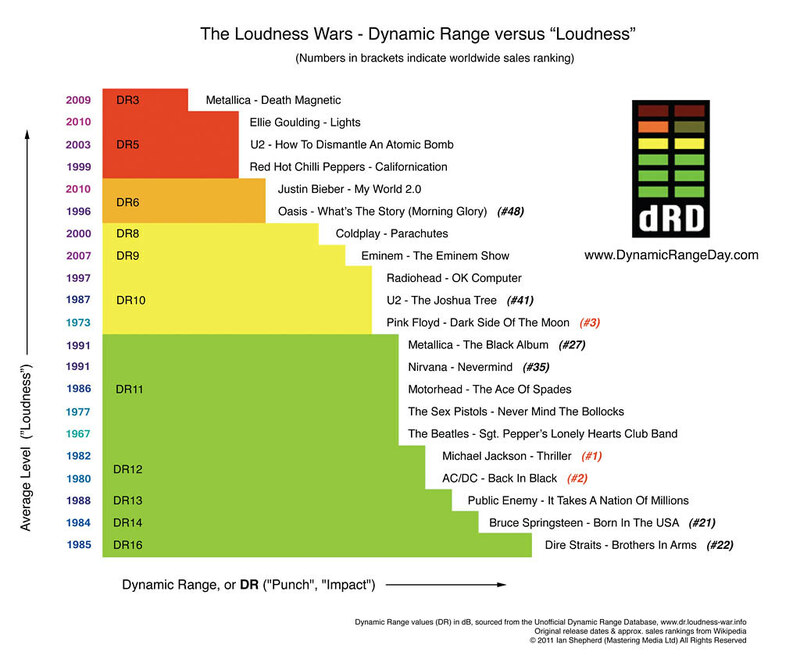 Matt Mayfield’s “Loudness War” Youtube video is seven years old already – and it’s still the single best short illustration of the problem with the loudness war ! – and here are some more Things You Can Do ! It’s amazing what the offer of free stuff can do ! And there are still a few hours for people to enter the competition – with a selection of superb prizes from out amazing supporters ! Tell people to enter now – and then watch the webcast tonight at 10pm GMT to see if they’ve won ! Another Thing in an hour’s time – and here are some other Things You Can Do ! DRD Thing the Third – Read the Research ! Please share this image with the link – and check out the page, if you haven’t already ! Twitter and Facebook are great ways to do this – just send them the video and link from “Thing the First” and ask if they would like to share it with their followers and fans. Here in the UK, the BBC are very responsive – you could try accounts like @bbc_introducing, @BBCRadio2 or @BBC6Music, for example. It could also be effective to contact radio shows directly, especial if they’re on air – for example @BBCRadMac are on 6Music now !Music celebrities – maybe @amandapalmer, for example ?